I’d love to know what magic ingredient they’re putting in the water over in Spain because it is fast becoming the hub of incredible nursery design. When we brought you the amazing Baby Suommo furniture in September, we thought luxe glamour could go no further, but fellow Spaniard Alondra has set out to prove us wrong! 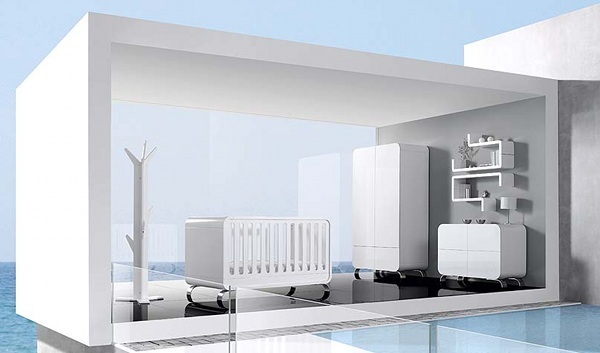 If James Bond had a baby, then surely this would be the nursery for 007 Junior, with vast, polished uber-modern rooms complimented stunningly by Alondra furniture. My eyes have been utterly spoiled by these visions of loveliness – modern softened with curves is my ideal in design and Alondra has come to the party! 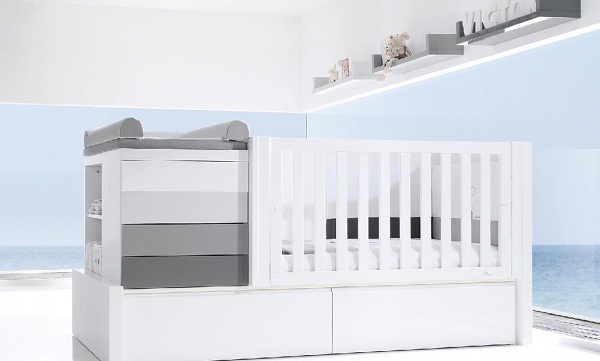 You’re looking at Alondra Baby’s Premium range which seems to span an incredible amount of pieces, from cots to wardrobes, to dressers to a bassinet – the Crib 680 – which transforms into a desk. The very fabulous Kurve cot (top image) also becomes a desk. We just love the unusual colour choices from Alondra. These are extreme bedrooms of the very best kind! I wonder if we’ll ever see this brand come to Australia? See Alondra and many more amazing furniture brands in our recent editorial about the Kind + Jugend trade show in Germany.